Charles, who started bladesmithing in 1985, offers a distinctive approach to the art of metal working. As an artist, he crafts handmade knives and swords from historic examples, his own designs, and patron’s inventions. Each section of the knife – the blade, the handle, the fittings - is designed to balance the piece both physically and visually and is shaped and fitted by hand for the best results. Both the blade’s balance and the temper are tailored to the use of the blade and, on a bespoke order, to the size and strength of the owner. As a martial artist he brings the knowledge and experience of 20 years study in practical sword and knife use to every blade he creates. Sarah works as the business manager, booking agent, customer service rep, forge-slave taskmaster, accountant, webmaster, part-time smith, and general get-it-doner. She is much too busy to find a photo where she actually looks cute. 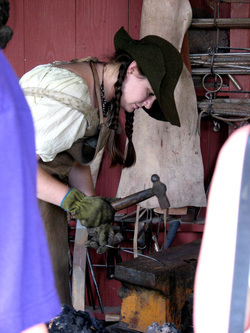 She would also like to remind the apprentices that this is not proper posture for forging.